Speaking from my (admittedly extremely limited) experience with buying and testing vintage cameras, when they photograph really well, they don’t output nearly as well (or at all). I have the Foldex-20 in mind here. To be fair, the jury is still out on that camera as I’m waiting to see the results of running 35mm through this camera (and not using the bulb mode and using a tripod for every shot, etc.). It also helps to remember that this camera was purchased mainly for respooling purposes—though I’ve not had good luck with this either. Ah well, it’s fun to photograph. And I’m hoping that this will not turn out to be the case with the Zorki 4 (pictured above) as it’s another camera that I don’t know that I—that is to say, that the Canon Powershot S5 and I will necessarily tire of photographing. Even the Vistaquest wanted in on the action—see first image in series below. 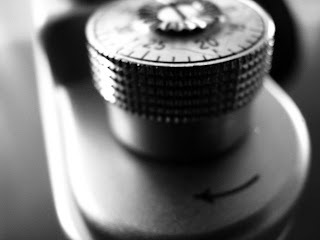 Not sure what it is about some cameras that make them seem (at least to me) like better subjects than others. 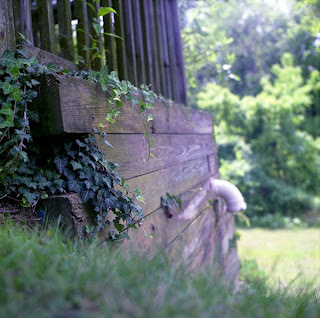 Case in point: It’s really hard (I think) to get anything decent of the Vivitar or the Vistaquest. I’m still not a fan of the Vivitar but I (obviously) love the Vistaquest so it’s not a matter of my feelings about a camera influencing things. That is, if feelings had anything to do with it, I’d be taking photos both with and of the Vistaquest all day long. I’ve not yet had time to shoot a test roll with the Zorki as I spent most of yesterday trying to figure out what was up with the Kiev 4AM that I came along with the Zorki 4. 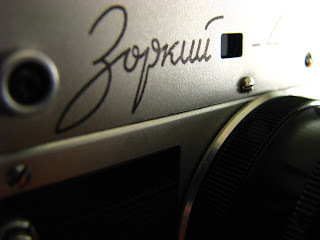 When I was researching these cameras, I read that the Kiev had a “whisper quiet” shutter (unlike the Zorki), so it took me a while to figure out if the shutter was really that quiet or just not working at all. Turns out it was just not working at all, so that’s going back today in exchange for a Kiev 4M. And speaking of shutters not working, yesterday was really a disappointing camera day for me. 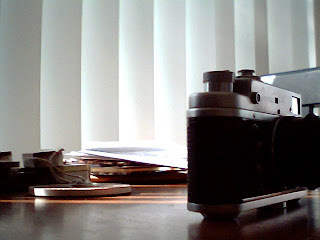 I also received an Agfa Ansco Shur-Shot B-2 which is, cosmetically-speaking in incredible condition. I was really psyched about this camera as it takes 120 film and it also takes 8 full or 16 half-size/shot pictures. Plus, it was cheap and, as I said, in great condition—it needed far less cleaning than any of the other old (but new to me) cameras I’ve picked up in the past month or so. So the shutter seems okay the first few times I click it and then it sticks. I take the front off the camera to see what’s what and the shutter spring is still intact but it’s clearly not resilient enough to keep things working. With my help, it would function correctly once or twice and then nothing. Not sure if there’s anything I can do (or learn to do) to fix this—again, all that needs fixing/replacing is the little safety-pin looking mechanism that connects the sliding part of the shutter with the shutter lever. I put it aside and figure that I’ll do some research and see what, if anything, might be done to make this work. In the meantime, the viewfinders are pretty sweet so if nothing else this might be another good ttv camera. I’m bummed though because I was hoping to do a test roll of the half-frames this week. I’ve not tried taking pictures of this camera yet but I’m guessing that if/when I get around to it, I’ll find that the Canon will love photographing this camera. Just a hunch. So I was bummed about the Shur-Shot but I was more bummed about the Kiev situation mainly because it was the first camera I ordered and I’d been waiting (or so it felt) forever for it (and the Zorki) to arrive. It was mainly to give me something to do to pass the time while waiting for them to arrive that I began checking out what other kinds of old cameras might do, favoring those that could be had for under six bucks. It’s been fun playing around with the Brownies, the Foldex-20, Trailblazer, etc. but I was eager to see what these rangefinders could do. Feels like I’m back to square one with the waiting but at least I’ll have the Zorki to work with and learn from in the meantime. Provided of course, the Zorki doesn’t have more in common with the Foldex-20 than being a camera I enjoy taking photographs of. After my last post, I decided to do a flickr check to see if other shared my love of (or sense about) the kind of pics that result from the Vistaquest VQ 350. I didn’t find that but I found this cool mod for another Vistaquest. I’m thinking, mine has 5 screws too, so this might work. No go. My lens wasn’t moving clockwise, anticlock-wise or other. Strike one. 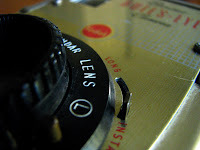 I thought then that I might flip the lens on my Kodak Brownie Bull’s-Eye. Took that puppy apart and no go. Kodak wasn’t playing at this point. Not only does this one guard against double exposures (as well as using 120 spools in either the take-up or supply side--argh! ), but it also prevents lens flipping without gluing stuff where it shouldn't be glued. No problem, the camera is at least cleaner now. But I did manage to set it up with a roll of 35mm. We’ll see how this test roll goes. I love this camera. Seriously. I think I got all .3 of its wonderful megapixels for 22 bucks or so (new) on amazon three or four months ago. 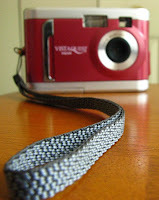 I had just bought the Magnavox keychain camera and was looking to delve a little bit more deeply in the megapixel world. My relationship with the Vistaquest VQ 350 got off to a rocky start and I almost returned it. There was absolutely no indication of which direction to put the three triple-A batteries in the bottom on the camera so I tried various configurations, thought I had exhausted all of them and so assumed the unit was broken. The plastic door that holds the batteries in is pretty flimsy (about the only criticism I have of this camera—that and the fact it appears that they are no longer making them!!!!! Yipes!) and I worried that I would, in my frustration, end up breaking it. Not only am I glad that I didn’t return it, I spend most of my time now thinking about whether or not I should pick up a backup (or two) in case anything happens to this camera. Plus, I’d really like to have it in grey as well the reddish-pinky color. I’m guessing the “painterly” aspects of the images this camera produces has to do with the it’s .3 mp. I dunno. I just like that this produces images that look more like paintings than photographs. At first this bothered me cause I was trying to do as little photoshopping as possible on my images taken with the Canon (Powershot S5) and worried that if someone were to see the images from the Vistaquest, he/she would assume that I had applied a photoshop filter gallery filter (or two) to the images. Because it’s small, light and relatively inexpensive, I thought this would be a good camera to carry with me everywhere I went. 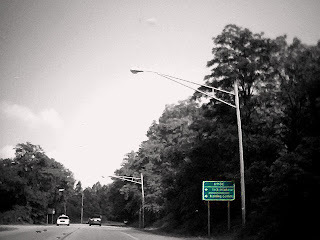 This lasted about a day because I scared myself silly when I found myself not being able to resist the urge to take photos while driving (see, for instance, the first image below. . .this one I did photoshop, making everything but the sign black and white). Driving is not my strength begin with and figured that adding photography to the mix was a really unwise move. I ended up putting the camera in the cabinet and shortly thereafter the holga arrived (and then the Diana, the Brownie and on and on) and it’s pretty much been about film experimentation for the past two months. In truth, I had kind of forgotten about the Vistaquest and its painterly aspects. 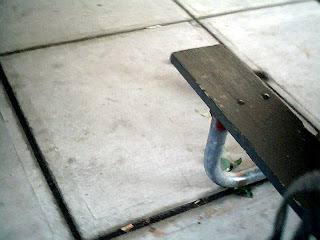 After deciding (just yesterday, in fact) that I should probably slow it down some on the film-taking-front, I took the Vistaquest for a spin up to the post office, figuring that I could park there, walk around town and take some downtown pics so that I could see how they compare with those I'd recently taken with the film cameras. After playing around with some cameras that definitely don’t like to take pictures indoors, I love that this one seems to do pretty well with inside as well as outside light. My fear at this point is that this is all going to end up as a variation of the story (or was it a joke?) about the guy who goes into the hat store only to end up leaving with the hat he came in with. I don’t recall if he actually bought his own hat (which would make this more of a joke) or if he just realized that he didn’t need a new hat but couldn’t see that till he had tried on a bunch of hats (making it more of a story with a moral). In his 1982 essay, “Variations on a Theme as the Crux of Creativity,” Douglas Hofstadter (def. not the individual pictured above) references a really cool book—one that he actually describes as “curious”—published by William Kaufmann (again, also not the individual pictured above) in 1978. The book is called One Book Five Ways. As Hofstadter describes it, “a manuscript on indoor gardening was sent around to five different university presses, and they all cooperated in coming up with full publication versions of the book, which turned out to be stunningly different at all conceivable levels” (245). The text (as “metabook”) features side-by-side versions of the various texts. Hofstadter, using language reminiscent of Marx Wartofsky’s (still not the statue guy), calls this a “foray into ‘possible worlds’” (245) and I’ve had the concept of this text in mind as I’ve thought about shooting the test rolls for the various cameras I’ve recently acquired. Otherwise put, in an effort to have some point of comparison for better understanding what I’m doing, what the camera is doing (or what we are doing together), I’ve made an effort to shoot similar things with the various cameras: the rusty tricycle, coneflowers, kitchen table, the spout out back, the woods, etc. Thanks to a recent flickr contact, I’ve learned how to put these images together in photoshop. (Prior to that, if I wanted to create a diptych or triptych, I’ve had to do that with the Nikon n50, remembering to take photos and cut the negatives accordingly before I try to scan them.) The William Sondheim (that's the guy pictured above) triptych featured here is comprised (left to right) of a shot taken with the Yashica D, the (quite toylike) VistaQuest VQ350, and the Ikoflex. Not a terrifically interesting (or, in Hofstadter’s terms, “curious”) composition, but in the process of putting this together I’ve begun thinking about ways to achieve more interesting variations on this particular theme. Hmmm. Sweet. 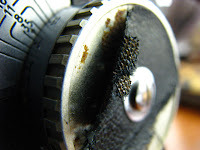 . . not that I should be giving wardrobe/fashion advice to anyone or anything these days but I was in the process of researching helio lenses when I ran across a discussion about re-covering a Kiev 4. That discussion led me to this page where I learned that for the not-highly-unreasonable price of 26 bucks (plus shipping) I could get my Ikoflex a new suit. I could, of course, live with it in its current condition (most of it is fine, save for covering on the one knob and a portion of the top and side where the original covering is starting to pull away), but I think it would be much happier if it could wear seal grain red imitation leather. I, on the other hand, would be happiest if it could wear (as all things should) leopard grain imitation leather but they don’t seem to offer that option. The question at this point is whether I’m handy, patient, or simply coordinated enough to remove the old covering and all the gunk beneath it. My fear is that I'll get a third of the way done and want to quit. 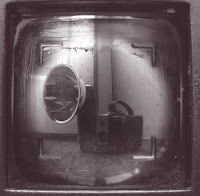 The two new Brownie Hawkeye Flashes and the Trailblazer 120 (see below) arrived yesterday. Actually, they arrived just as I was starting to take apart the Foldex-20. I was disappointed with the test roll I shot with the Foldex—then again, when I purchased this one, it was mainly with the thought of using it as a respooling mechanism. That, however, didn’t work out that well. I decided to see what difference it would make to unscrew the front piece and clean the lens. 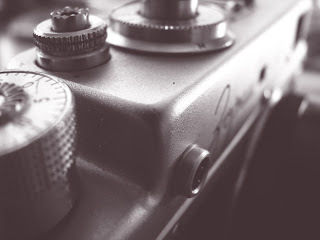 While I was at it, I decided to do a variation on the brownie and holga mods I had read about (or viewed and listened to) online and try to run a roll of 35mm through the camera. I wasn’t sure how far to advance the film, so with this test roll, I did three turns of the film advance knob. I ended up getting 7 shots on a 24 exposure roll of 35mm. Hmm. If these photos even turn out, if this mod is even worth attempting again, I can see if I can get by with fewer turns on the advance knob so I can get more shots per roll. 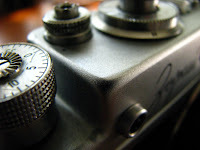 My other option would be to convert the Foldex-20 into a pinhole camera. Sounds like this mod is pretty easy. As for the Brownies: Compared with the condition my first Brownie was in when it arrived, these new Brownies look like they were made yesterday. (The Trailblazer 120 is another story.) The Brownies didn’t need nearly as much cleaning as the first one did but I wanted to see if I could clean up the plastic viewing mechanisms and the viewing mirror so that I could get better ttv (through the viewfinder) shots. Getting the right screw on the top of the plate to come out proved to be a real feat. With patience and much persistence, I eventually managed to get the front piece off one of the new Brownies as well as my old one, but the other new Brownie—well, I decided to leave that one for another day. Odd since the screws don’t appear to be rusty. But the top right-side one, wowsa. Hard—almost impossible—to get out. Aside from being much cleaner (and so newer looking) than my first Brownie, these Brownies don’t have brackets on the plastic viewfinder piece on the top of the camera. No biggy, just a small difference I noted. I decided not to flip the lenses on either of these (I've still got the lens flipped in the first one I bought) until I run test rolls in them. I’m eager to see if these will accept 35mm film and to see if I can use a trimmed 120 spool in both the supply and take-up sides of the camera as I’ve (most miraculously) been able to do with the first brownie. Anything to avoid losing my 620 spools, respooling by hand and/or attempting again to use the Foldex to respool! As for the Trailblazer 120. Sigh. I have to say, when I decided to purchase these items, I saw the Trailblazer as a bonus extra--kinda like getting a toy in a cereal box. 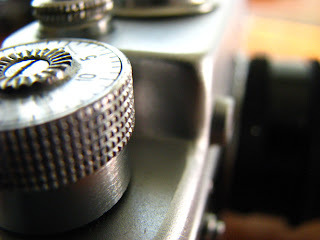 I’ve only been able to find a few references to this camera online or on flickr and from what little I’ve read, it’s not a stellar performer. But that’s fine. The whole lot was only 8-9 bucks and that covered the two brownies, one flash attachment, a couple of flash bulbs, the box that one of the cameras and the flash attachment and bulbs originally came in and the trailblazer. The seller had it marked as a Kodak Trailblazer but that’s not correct. 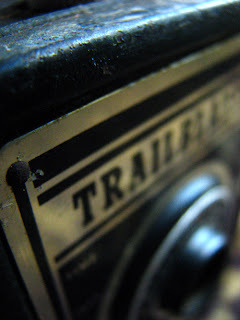 Kodak didn’t, in fact, make the Trailblazer 120. So I tried cleaning the exterior but got nowhere fast. The front and back pieces are metal and they were a bit easier to clean, the front especially. I cleaned up the lens and ran a test roll through. Like the Foldex-20, the Trailblazer only takes 8 shots on a roll of 120. What’s worse, like the Foldex, it’s hard to tell (by sound alone) if the shutter worked correctly. And since I’ve taken myself off bulb-time settings, well, I had to trust that it worked with the regular setting. I don’t have the greatest hope for these shots. Actually, I don’t really have any hope that they turned out. Besides the shutter issues, it’s hard to keep the camera steady while pushing in the button for the shutter—this is also the case with the Foldex but the Foldex has a tripod mount which helps a bit. 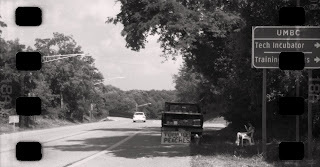 So I’m guessing that if the Trailblazer’s shutter worked, the pics will all be blurry. Ah well. Again, I saw this camera as a bonus extra—probably not one I will use that often or maybe even again. Bummer to only get 8 shots per roll. That said, I would be open to seeing if I can run a roll of 35mm through the Trailblazer since making mistakes with a roll of 35mm is cheaper (in terms of film and developing costs) than making mistakes with a roll of 120. I want to wait, however, before attempting this to see how much extra space was left between shots on the Foldex. . . .a camera with whom I’ve not always had the easiest or happiest experiences (that said, when she’s feeling cooperative she’s helped me produce some of the images I’m most proud of), I should say that I’m fairly pleased with the pinhole test roll. All the shots turned out--they weren’t all good, of course, but I didn’t have any totally botched shots (read: taken while lens cap was still on) which is huge in terms of my experience with the Diana +. Holgas are, in my opinion, the more consistent photo-makers. Given my rocky relationship with this camera, it’s hard to say if the pinhole images look much different since it was often hard to see any of the pictures I’ve taken with the Diana. I also used a tripod with most of these shots which makes a huge difference, I think. As much as I love the blurry/dreamy look that Dianas often afford (note as well the light leak on the image above), part of me is really excited when I take a picture with the Diana that looks like it might have been taken with a non-plastic or non-toy camera. Ironic to respond this way when I bought the Holga and Diana precisely because they could provide images that didn’t look like they were taken with my canon or Nikon! I’ve been warned that you can’t really anticipate or control what these cameras do which is why (I think) I like the shots that don’t look like the majority of the others on the roll. Another batch of negatives arrived yesterday, so the afternoon turned out to be a scan-fest (yawn). I received the test shots for the Foldex-20, Yashica D, Zeiss Ikon Ikoflex, Vivitar ultra wide and slim, and the Diana+ pinhole shots. Save for a lot of overexposed Foldex shots (I went bulb/time-setting crazy again) and a few underexposed (nice change for me) shots with the Vivitar, it was the best batch of negatives to date. All by way of saying, most of the shots were in the ballpark of being properly exposed which meant much less work for me (and photoshop). Wisely, I think, I dealt with the Foldex and Vivitar negatives first since I could see that they had more problems than the other rolls. I saved the tlrs for last which was smart as I was most pleased with how those turned out. Last night I was anyway. Looking at the images this morning, I’m wishing they were better, other, different, etc. 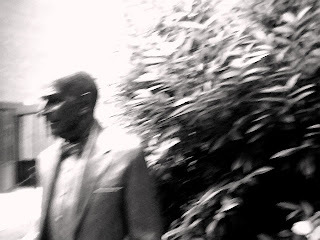 Or maybe it’s better to say that I wish I were better, other, different in terms of taking photographs. 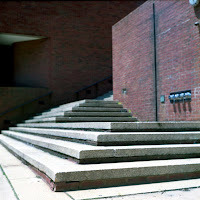 Not surprisingly, perhaps, my favorite shots are those that feature different subject matter, things I’ve not attempted to photograph before—like the stairs image above, shot with the Yashica. 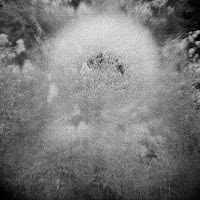 Then again, part of the plan for test rolls was to photograph the same things so I’d have some point of comparison to judge what was happening. I’m actually eager to receive the next batch of negatives as most of those images are of things I’ve not photographed before. Not a woods, tricycle, kitchen table, or coneflower image in the bunch. (well, maybe there will be one or two.) Still. . .
As far as the tlr images go, I’m feeling less pleased with them today so I’ll try to remember what I was thinking while I was scanning them in yesterday. I did the images from the Ikoflex first—not sure why, exactly. I know that the person from whom I bought the camera said that I should shoot a test roll and if I wasn’t happy with the camera or results, we could work something out—an exchange or refund. Maybe that’s why I started with those negatives? After seeing the first image, I remember thinking, “Oh my gosh—so this is what it’s like shooting 120 film when you actually have a shot at controlling how the pictures come out!” Nothing against the Holga, Diana+, Foldex-20, or Brownie Hawkeye as I love working with them, but I recognized that this was a totally different shooting experience. It made me even more committed to saving up for my dream camera—the Kiev 88 SWC. 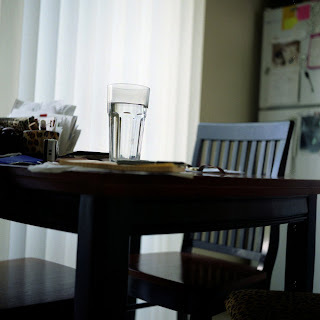 The Ikoflex is much easier to take pictures with—the focusing is great (see image of water glass below) and I was really pleased with the sharpness of these pictures. The compositions were a little off but I like the DoF. In short, I was really excited about the results yesterday. With the Yashica, it’s a little harder to focus—to see exactly what you’re getting. 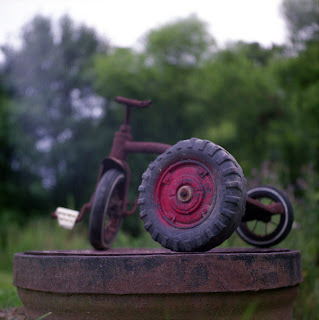 That said, the colors were really, well, interesting (see bike image below) and, all in all, I think I took more interesting shots with the Yashica—meaning that the compositions were a little bit more interesting. 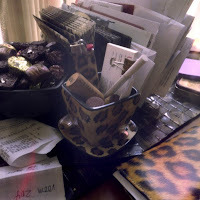 I also tended to experiment more with what I was focusing on—or where. 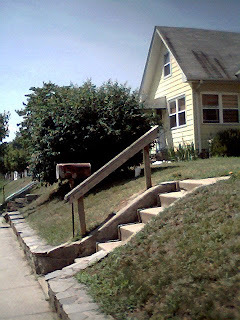 That is to say, I wasn’t focusing on whatever was at the center of the composition (see ivy/spout shot below). The pic, titled "for sale," represents a number of “firsts” for me which is one of the reasons why it’s currently one of my favorites—at least of those I’ve taken. 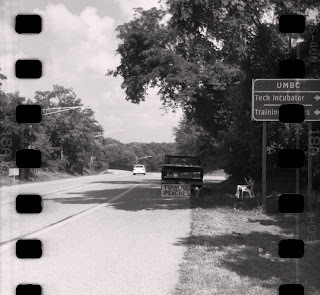 It was the first time I was attempting to shoot 35mm in the holga, so I was worried that something had gone wrong (i.e., that the film wasn’t spooling correctly) and I was also crazy-worried about the process of taking the film out of the camera and rewinding it by hand in the dark. 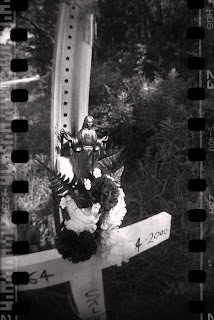 What’s more, since I’m never quite sure where I’m at on a roll when shooting 35mm on the Holga (i.e., I knew that this wasn’t among the first couple shots I had taken), I was afraid that when I started the 34 click cycle I’d find that I was already at the end of the roll. 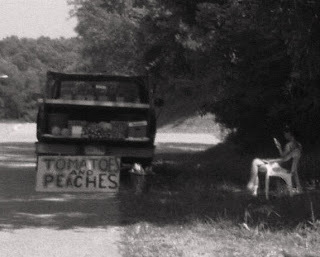 I had walked past this woman selling produce on the side of the road and I really, really wanted a picture of her and the truck or at least the truck. But I was afraid to ask. I walked on. On my way back home (this involved passing her again), I noted that the light falling on her was amazing. She was talking on the phone and I remember thinking, “just take the shot—maybe she won’t mind.” I also remember thinking, “boy I wish I had the brownie hawkeye flash with me as using that makes it look less like I’m taking a picture.” I pretended that I was waiting to cross the street, to see if she would look up and notice me. She didn’t. I ended up taking the shot--the first I'd taken of someone I didn't know--and well. . .that takes us to the point where this posting began. This shot was taken during my yellow-tape phase and when I saw the first of the green negatives, I remember thinking, “please, please let that one shot be the exception.” It wasn’t. 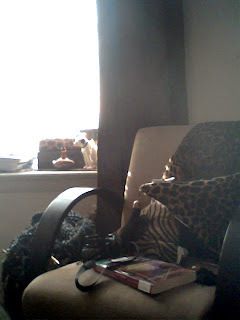 (There was one though that was notably un-green but that was taken inside the house, so I reasoned that the brighter the surroundings were, the greener the negatives became.) It wasn’t quite as green as green had proven to be, but still. Thankfully, it was salvageable. Beyond representing these “firsts” (again, first time I ran 35mm through the holga, first time I took a picture of a stranger) this was the first time I really played around with cropping tools. With most of my digital pics, I post or print them as they are. That is to say, save for resizing them, doing a little level-tweaking, sharpening, or maybe converting color to black and white, they are usually posted without being cropped or filtered. The uncropped version was okay but it was easy to overlook (or I thought so anyway) what I loved most about the pic and what I had hoped would be captured on film—the way the light was falling on the woman as she sat in the chair, talking on the phone. So I played around with the cropping tool a bit. The mostly tightly cropped version gets a little too grainy and you lose the sprocket holes (the whole point of using 35mm in the Holga) but I also think it looks most Holga-like. Here is the full version followed by the others I tried. The last batch of negatives I had developed was really disappointing—and I’ll admit now that this was all me, having nothing to do with the place I have the film developed. Of the five rolls I sent in, only one came back with decent (read: properly exposed) images on it. No surprise that this roll was shot with the Nikon n50—as long as I pay attention to what the camera tells me about shutter speed and aperture, the images look okay. Don’t get me wrong, I love shooting film but the waiting part (i.e., having the film sent out to be developed and waiting for it to be sent back) is hard. Over the past year, I’ve gotten used to the immediate feedback you get from shooting digital—I can see what’s working, what’s not and adjust my behavior (and the camera’s shutter speed and aperture) accordingly. The lessons are immediate and so seem to stick. 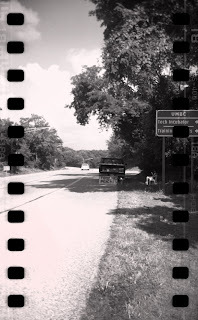 When the box of negatives arrived, I looked first at the rolls of 120 I ran through the Holga and the Diana. I wasn’t expecting much as I had kind of suspected that I was keeping the shutter open for too long. Seeing the negatives confirmed that. 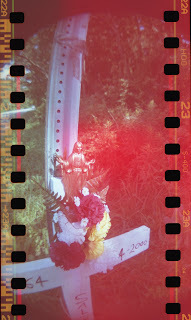 Feeling far more hopeful, I looked at the two rolls of 35mm I ran through the Holga. I had been feeling optimistic at this point because the modification part seemed to go well and that had been my biggest concern. But then I notice that almost every negative was green—not entirely green but most were mostly green. While this seemed to signal a slight improvement over the last batch of negatives (I could actually see what I had photographed), I’m thinking the green is definitely not a good thing. I scan the first couple of images and come to see that green means red. And then I start trying to figure out where and why things went so horribly wrong. So I’m thinking it’s mainly about my yellow tape mistake which—in turn—has to do with my being too cheap and too impatient to send away for the black gaffer’s tape like my copy of Plastic Cameras recommended Holga owners do. Not wanting to use duct tape inside the camera (i.e., to keep the batteries for the flash in place, to buffer the areas over which the 35mm film is pulled, to mask the red window on the back of the camera), and not having any gaffer’s tape to hand, I decide to use the yellow tape I recently purchased at a teacher’s store. No bueno. So I decided to try some fuji 160 iso film (I had been using 400) in my holga and diana and to compensate for the difference in speed/light sensitivity, I went bulb-setting crazy. and I mean crazy, holding the shutter open for 15-45 seconds, maybe longer. And this--entitled "hmmm"--was the result. You know a shot is really bad when you can’t even determine where you were or what you were shooting. I am assuming I was in the woods, but I’m not sure. I’m also not sure if I had an extra fun filter on the holga or not. Bottom line, I’ve lost my rights to use the bulb setting. It doesn’t matter if I’m shooting in the pitch dark, no more bulb setting for me, at least for awhile.